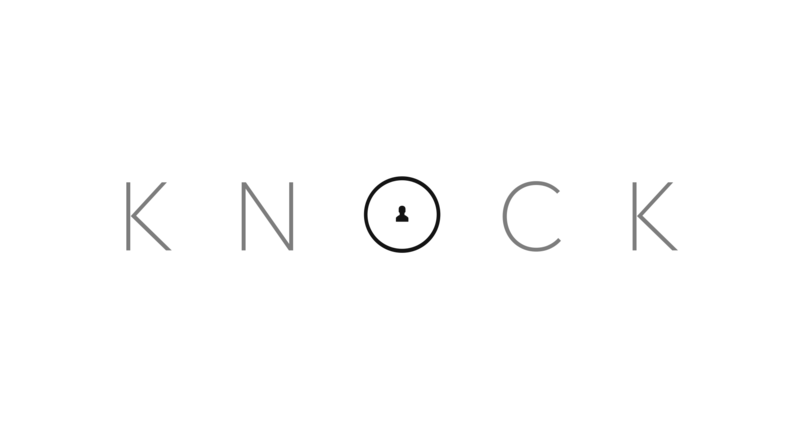 When I saw Knock to Unlock for the first time, I got really excited. It is such a smart way to handle an otherwise annoying task of having to unlock your computer every time it locks. I’m a huge fan of credential-less / multi-factor authentication, and this product was the first one in quite some time that got me really excited (I think the initial “magic” of Dropbox was the last thing that wowed in the same way). Then I got bummed out when I realized I didn’t have a supported Mac. Since Knock utilizes BTLE (BlueTooth Low Energy) 4.0, my 2008 Mac Pro didn’t have the goods built-in. I tried out Knock on my supported 2012 Mac Book Pro, and after seeing it work great, I was determined to get it working on my Mac Pro. I’m happy to report, I got it working like a charm (care of a minor additional purchase). Here is how I got it to work. So, the key to making this thing work? A Bluetooth 4.0 USB dongle that is supported by OS X. Note that most USB dongles won’t actually say they support Mac, even ones that do. To that end, there are many (more) Bluetooth dongles that say they don’t support Mac and in fact do not! Therefore, I will only recommend the USB dongle I got working on my Mac: the IOGEAR Bluetooth 4.0 USB Micro Adapter (GBU521) (Amazon Link). Of paramount importance is the “GBU521″ model, for reasons I explain below. At the time of this writing, the thing cost about $12 + shipping and taxes. This specific model of the adapter is explicitly supported by OS X out of the box. Saving too many technical details, I have found that OS X explicitly calls out this adapter’s Bluetooth product and vendor ID in the system’s IOBluetoothFamily.kext driver in a way that makes it recognized by the system to work not only with Knock but all of your other Bluetooth peripherals as well. Good times! So, after ordering the adapter, and before plugging it in, there are a few things you have to do. Keep in mind you are going to have to re-pair your keyboard and mouse, so plan accordingly. Turn off bluetooth. Do this through the Menu Bar or in the Bluetooth System Preferences pane. Your existing bluetooth stuff stops working. Plug-in the new adapter into any available USB port (I attached mine to a port under my wired keyboard). (The Knock app may or may not launch and show the “fire it up” screen). 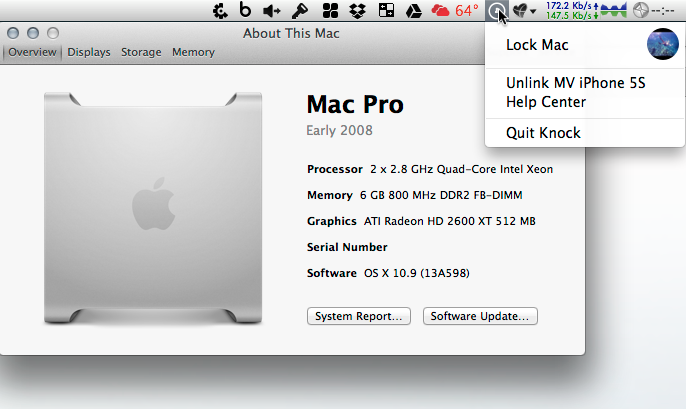 If you don’t see the above screen, launch or quit/relaunch the Knock application on your mac. It should come up and you should no longer see the “unsupported mac” screen. Wait at least 10 seconds, then turn Bluetooth On again. 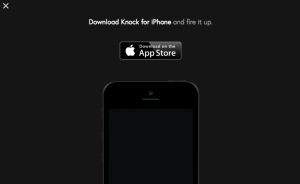 Launch the Knock app. 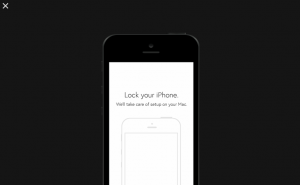 If all goes well, you should see a screen telling you to lock your iPhone, at which point you are paired! Re-pair your other bluetooth devices (which are now connected using BTLE by the way) and you are good to go. Please share and add a comment if these steps worked for you (or not). Although this should all largely work, I did have some problems while writing these steps (the second time around; the first time worked perfectly). I was seeing things like “iPhone” flashing in my bluetooth menu, and the mac Knock app wasn’t recognizing my phone. I ended up deleting the device entry from the Bluetooth preference pane, and disabled and re-enabled bluetooth on my phone. Immediately after doing that, the phone connected properly and paired with Knock as expected. If things really are going sideways, and you are a developer, there are a suite of Bluetooth tools available from the Apple Developer website called “Xcode Hardware IO Tools – Oct 2013″. In there you can look at logging and see what may be going on (but I’m not going to cover that here!). Xcode Bots, hosted git repositories, and automated TestFlight builds! Dani on Xcode Bots, hosted git repositories, and automated TestFlight builds! Πακέτο διακοπών για Ρώμη on Xcode Bots, hosted git repositories, and automated TestFlight builds! youngMildred on Xcode Bots, hosted git repositories, and automated TestFlight builds! jokes on Xcode Bots, hosted git repositories, and automated TestFlight builds!